A very interesting report was published during the summer holidays! Sciencewise commissioned Ipsos MORI to carry out research into the public’s views of emerging areas of policy involving science and technology. 30 issues were identified through a process of consultation with experts involved in policy making and science and technology at a workshop run by the Cambridge Centre for Science and Policy. Participants of the workshops created a grid showing how important they thought each issue was, relative to others. 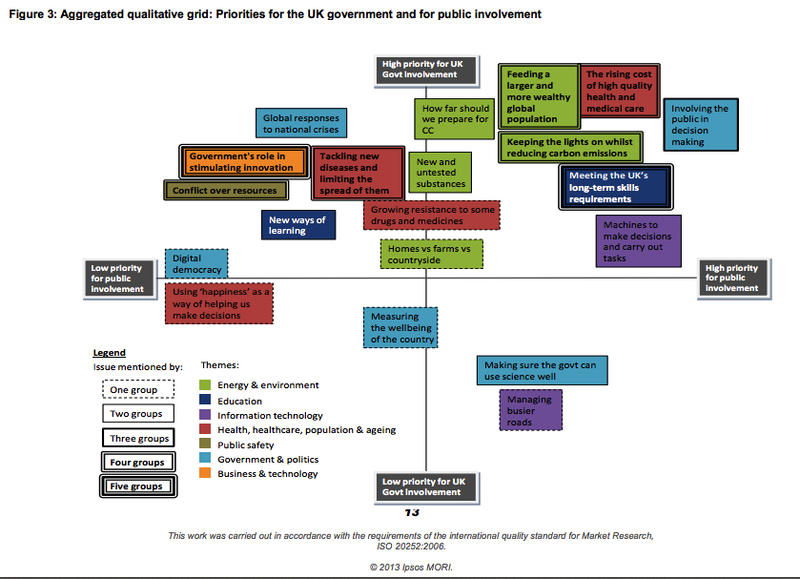 On the vertical axis, they showed how high a priority they thought each issue should be for the UK government, and on the horizontal axis they showed how high a priority it should be for the public to have involvement in policy-making related to the issue. The way the public responded to the issues we showed them highlights some of the challenges for engaging the public with emergent science and technology issues. Sciencewise and others should now consider how to address these issues. How to deal with multi-stakeholder, multi-layered issues? We know the public are interested in learning about the more complex issues that do not sit with only one department or policy stream; government stakeholders should work beyond internal silos to engage the public in shared dialogue processes. Issues in dialogue must be framed so they are relevant to the public but without oversimplifying. This project, like others, underlines the need for stimulus and framing materials which enhance specificity, urgency, relevance to individuals in the UK as well as educating participants about risk and uncertainty. It may be a challenge to deal with the issues which are high risk and far off – is there a role for more explicit horizon scanning and scenario planning exercises within public dialogue? Dialogues about how to engage the public with risk and uncertainty. Can we find out more about how people want to engage with ‘wicked’ problems? Some issues contain a “lack of consensus on fundamental facts or judgements” – what would a public, educated about this phenomenon, say about the issues? Dialogues about how values are formed. We need to find out more about underlying tensions in dialogue, for example the range of views on individual rights vs collective responsibilities. A dialogue on the underlying issue of personal freedoms versus responsibilities, as this relates to science, taking in a range of different scientific or technological advances as stimulus, might be fruitful. Can we find out how the public feel these values should bear on decision making in science? Different engagement for different times in the policy cycle. Do we need engagement on how policy is to be implemented (‘Keeping the lights on’)? Or on the moral and ethical level about the principles which should drive policy – (‘Rising costs of healthcare’)? Dialogue should take place at the point where participants can see it their input will have a certain effect. Tackling cynicism. In this dialogue participants emphasised that their involvement was conditional on it making a difference to policy; but they did not really believe such difference would happen. The differences dialogue can make are subtle, nuanced and long-term but policymakers need to communicate what the dialogue achieved. Also, participants were keen to know that their view would not be ‘outweighed’ in the decision process by voices of vested interests. Those running dialogues should explain how the views of the public are balanced with the views of other stakeholders in decision making.